Acadian Genealogy Homepage; "Boot Your Roots"! "This CD is a compilation of more than 519,000 names and pedigrees, from 134 participants with Acadian Roots. That in itself says a lot, but there is more. "First of all let me say that I am a French Canadian of Acadian Ancestry, originally from Grand Falls New Brunswick, which is right smack in the middle of the "Madawaska Territory" where so much of the Acadian "happenings" took place. In May 1990 I was forced to stop working (on a permanent basis) because of a severe cardiac condition. I had had two previous heart attacks (in 1979 at age 39) and 1980. This was followed by a triple heart by-pass in June 1980. I was "fine" for ten years, but in 1990 I had another heart attack! At the time, I was General Manager for Inglis Limited, the Canadian subsidiary of Whirlpool Corporation. So in an effort to "stop climbing the walls" (after I stopped working) I got involved with tracing our family roots...the CYR's right back to France (13 generations); the THERIAULT's (my wife's maiden name), the OUELLETTE's (my mothers maiden name) and the MICHAUD's (my mother-in-law's maiden name...all Acadian descendants...all traced back to France. Results, about 11,500 names in my personal data. In April 1994 I started reading "messages" on various Genealogy Newsgroups/BBS' and the suggestion that "we should have an Acadian database for the upcoming Congres mondial Acadien", caught my eye. "Great idea" I thought and started to try to encourage the "more knowledgeable genealogists" to undertake the task. After hearing a "lot of talk" but seeing "little action", I offered my services to endeavour to "pull the thing together" as a NON-PROFIT PROJECT, for the benefit of all. 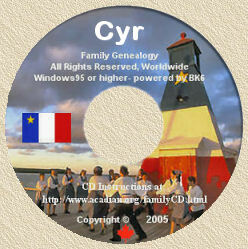 After many hundreds (probably thousands...no, not "probably"...I'm certain it was many THOUSANDS) of messages, I managed to get 142 persons (Acadians) willing to submit their personal GEDCOMS to be included on a CD-ROM...the benefit to them being that they/we would receive a copy of the CD AT THE ABSOLUTE COST PRICE!" "Mr. Cyr started receiving GEDCOM files by diskettes and E-Mail and the awesome project was started. He found a programmer in California who prepared a "search/seek" engine specifically for the CD, which allows the users to compare their own GEDCOM files with those on the CD. This programmer is providing "assistance" to those that might have problems...but so far not one report of a problem! Special attention was paid to ensure that the files on the CD were virus-free and that the GEDCOM files were placed as they were submitted. Each submitter was required to give their name and address, so that users of the CD could contact them relative any descreptencies in date, could be resolved. Even with all this information, Mr. Cyr was not finished. He also included on his disk, as much genealogy-related Freeware/Shareware as he could find (over 200). One of which is a "Software REVIEW Program" that provides reviews on most of the PAF Utilities on the market. Also included on this CD are "Reference Text Files", these are files that Mr. Cyr encouraged his submitters (in the end, there were 134 participants) to include. One of which is the Acadian Censuses. With all this under his belt, Mr. Cyr had the tremendous task of now finding a way to produce his work of art. He was able to find a manufacturer who would produce his disk in limited quantity...a one-run agreement. Nevertheless, he had less than three hundred takers for his CD. Word of mouth/E-Mail has been good and the manufacturer has agreed to provide him with an "overrun" on consignment basis. However, this is for only as long as it is worth their while. Bottom line is that Mr. Cyr will continue to make the "In Search of Our Acadian Roots" CD to anyone/everyone for as long as he can get a supply...and at the original COST PRICE! This is truly an "Historical Acadian Genealogy Effort"! You can send personal cheque, but understandably the CD will only be shipped AFTER the cheque has been cleared by your bank. Whereas, orders by Postal Money Order are shipped "same day" and if you provide your Internet address, Mr. Cyr will confirm date-of-shipment, by E-Mail. The purpose of the "Arizona Genealogical Computer Interest Group" is to gather, review and pass along information specifically dealing with Computers and Genealogy to its members. "Boot Your Roots" is published five times a year, for the interest and edification of members of A.G.C.I.G. and, I might add, is one of the best Newsletters I've personally seen! For additional information, contact its Membership Director, Jane Linkswiler at 241-1290, or its Newsletter Editor Rosemary Gibson Perry at 759-8698.